The American Prize is honored to announce the winner and runners-up in the high school division of The American Prize in Wind Ensemble/Concert Band Performance, 2014. Congratulations! The Frederick Fennell Wind Studies Program was created in 2003 by a generous contribution in honor of legendary conductor Frederick Fennell. The program offers a comprehensive wind studies education that allows students to enroll in masterclasses, work with an inspiring caliber of guest artists, and attend festivals. 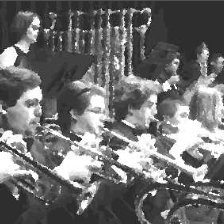 The program also provides students with the opportunity to perform in large ensembles, as well as chamber ensembles. The Frederick Fennell Wind Studies Program provides a focused, high-level, quality education to instrumental music students. The Wind Ensemble, conducted by Teren Shaffer, is recognized for high achievement throughout the country. Regularly earning unanimous superior ratings at festivals, the ensemble won second place in 2012 for The American Prize. In 2013, the group was featured as the only high school band to represent the state in a performance at the California All-State Music Educators Conference, and in 2014 was selected as one of 16 ensembles from across the country to perform at the National Concert Band Festival in Indianapolis. The North Hills Wind Ensemble has a long and storied history. The ensemble has been featured at conventions around the country including the Midwest Convention (six times), the Concert Band National Convention, the MENC All-Eastern Convention (eight times) and PMEA State Convention (eleven times). Guest soloists and conductors have included William Revelli, Arthur Fieldler, Arnald Gabriel, Allen Vizzutti, Urbie Green, Fred Hemke, and Louis Bellison among many others. 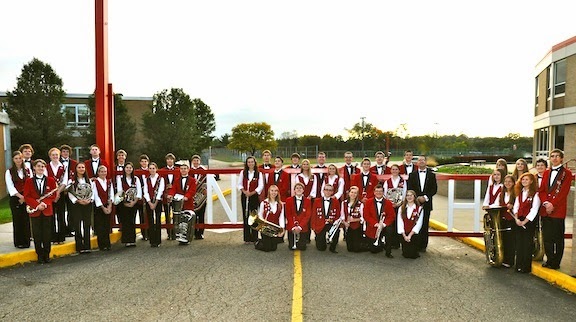 The North Hills School District has adopted the band’s motto of “Pride, Tradition and Excellence”. Among judges' comments: "a very polished, energetic sound and a very persuasive way of presenting each work..."
Clear Creek High School is located in League City, Texas, just south of Houston near the NASA Johnson Space Center. The Clear Creek Wind Ensemble is the top-performing group of three curricular concert ensembles and has had a long tradition of excellence in music performance and artistry, earning exclusively superior ratings at UIL Concert and Sight-Reading Contest for over twenty years. In 2012, the Wind Ensemble was a National Winner in the National Wind Band Honors competition. Members of this ensemble study privately and participate in the All-Region, All-Area, and All-State bands as well as Solo and Ensemble contest each year." Among judges' comments: "...a cadre of top-notch musicians..."